Saturday morning I woke up after just four hours' sleep… one would have thought that the devotees would have found difficulty in waking up for Mangala Arati, but it was not so. In fact it was probably the most sweetly intense morning arati of the week, in my humble opinion. It seemed that the devotees were all extra charged by the events of the night before, and the number of people present incremented the devotional energy. The class given by Sripad Goswami Maharaj was as inspiring as all of the others he had given so far, while the devotees drank the nectar offered to them. Although the devotees were visibly suffering a little lack of sleep, the service mood overcame it. Villa Govinda enjoyed the services offered by the devotees for the pleasure of Srila Gurudev, whether it was cleaning seva, cooking seva, gardening seva, making flower garlands or so many other transcendental activities. 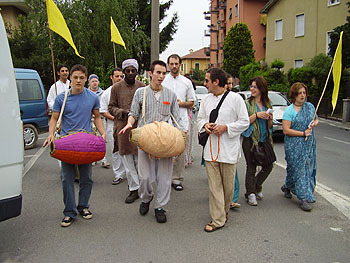 The Harinam Sankirttan began on the outskirts of Merate and moved gradually towards the city centre. In the afternoon, after honouring prasadam, a Nagar Sankirttan was organised. 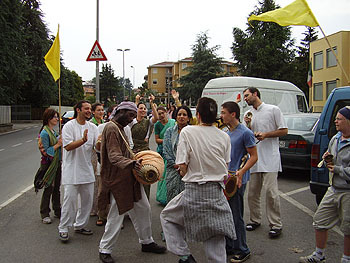 The inhabitants of Merate were about to receive another booster towards the revelation of Krishna Consciousness. The devotees piled into a van and two cars, equipped with mrdangas and karatals, and parking just on the outskirts of the city, we began by chanting the invocation. 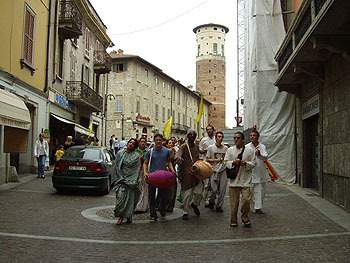 Quietly at first, the Harinam Sankirttan began, as the devotees gradually approached the city centre. At first the inhabitants were somewhat surprised to see the devotees appearing, infusing the air with song and music, with a dance in every step. As we proceeded, all the devotees became more and more engrossed in the chanting of the Holy Name, with the audience becoming more and more amused and attracted. Smiles started to blossom, and plenty of people were eager to take the flyers distributed in order to invite people to the Sunday program. Actually the kirttan became so ecstatic, with lots of dancing and quick steps, that even the devotees agreed that the energy surrounding the event was an extremely positive one, better than most of us had ever experienced. 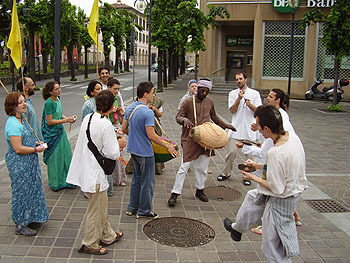 The pace increased to match the heightened mood and energetic chanting, making the passers by intrigued. Back to the carpark, the devotees seemed unable to stop the chanting and dancing, intoxicated by the feeling that overcame them. Soon however they stopped, glorifying their Gurudeva, and went on to the next call for service - grocery shopping for the Lord! Once we had completed a full wander around all the main streets of the town, we paused for a long while near the cars, as if reluctant to stop chanting. Finally another form of service called and we went altogether to the supermarket to purchase supplies for the Sunday feast the next day. Even the most mundane of activities feels beautiful when the focus is service of Gauranga through the mercy of Srila Gurudeva, and performed in the sweet company of devotees.